Read an extract from the William Hill-nominated book Forever Young: The Story of Adrian Doherty, Football’s Lost Genius. BELOW IS AN extract from Forever Young: The Story of Adrian Doherty. 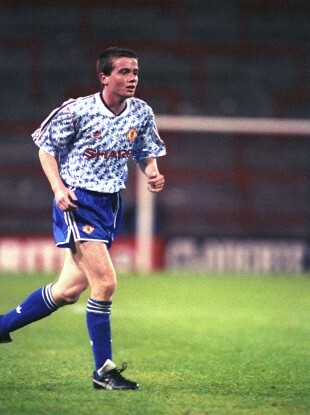 Doherty was a highly promising youth team player at Man United seemingly destined for first-team stardom before a cruciate injury put paid to his hopes of making it as a footballer. He died in a tragic accident in 2000, slipping into a canal while on his way to work for a furniture company in Holland. The mystery to Ferguson, Giggs and the rest of the coaches and players at United is why Adrian Doherty at times appears almost ambivalent about his wonderfully bright future. Music seems to excite him as much as football. Poetry, too, it is rumoured. When the club offered him an unprecedented five-year professional contract, to take effect from his seventeenth birthday, he stunned Ferguson by proposing a one-year deal before they settled on a compromise of three. His team-mates cannot work him out. The ritual among the apprentices and young professionals is that, after playing their Lancashire League fixtures on Saturday mornings, they head to Old Trafford to watch United’s first team in the afternoon. But Doherty prefers to give his two complimentary tickets away. He cuts an incongruous figure outside the ground, the scruffy lad with his guitar case, itching to hand over the tickets to some lucky soul so he can get on with his business. His football ambitions are far more serious than his dreamy demeanour suggests, but for now his Saturday afternoons are about music. At 4.45 p.m. he might look into a shop window – Rumbelows, Tandy or the like – to check the United result on the BBC’s videprinter. He might check the scores on Ceefax when he gets back to his digs later on. Or he might not. It is unlikely to be the first thing on his mind. “I had never seen anything like him before,’ says Ryan Giggs, sitting in an office at Manchester United’s training ground. “You would look at him the first couple of times in the changing room and think, “Well, he can’t play . . .”, because Doc didn’t really look like a footballer if you know what I mean. He was unorthodox in the way he dressed and the way he acted. He wasn’t like the rest of us. He played the guitar, he loved his music and he was obsessed with Bob Dylan. As a sixteen-year-old, I didn’t have a clue who Bob Dylan was. Everyone knows the story of Ryan Giggs, the boy wonder who was always destined for the top and who stayed there, tormenting full-backs, winning trophies and breaking records, for what seemed an eternity. What has been lost in the mists of time is that the most successful player in United’s fabled history was not always regarded as the best performer, or even the best winger, in the club’s youth team. Opinion is divided among former teammates, but there are plenty who, whatever their pride at having played alongside a living legend of British football, swear that at times even Giggs found himself in the shadow of Adrian Doherty. “I wouldn’t disagree with that,’ Giggs says. ‘It seemed like every time we went on the pitch, over a period of about six months, he was doing something special, whereas I at that time was a bit inconsistent. Doc always seemed to be able to handle any situation. He was off the cuff. “Playing alongside him or training with him or watching him, he would do something that would make you smile – beating three or four men and sticking it in the top corner. But what really stays in my mind is how brave he was. He would have defenders kicking lumps out of him, because of the type of player he was, and he would just get up and demand the ball again and keep running at them again and again. “I wouldn’t say he had a “ping” like Scholesy [Paul Scholes] or a technical kind of cross like Becks [David Beckham], but at the same time, he could switch the play and cross it. He could go past people at will. He could ride tackles like you wouldn’t believe. He could go inside, outside, play one-twos, pass and move. He just seemed to have a picture in his head from a very early stage. “You know in The Matrix, where everything clicks together, where it’s all happening quickly, but in the character’s head it’s happening in slow motion? It was like that with Doc. It looked like it was all instinctive, but it’s a bit like Wayne Rooney, where, yes, he’s a street footballer, but you know he’s also a real natural with a real football brain. Doc was the same. “For the manager [Alex Ferguson], he was the ideal player. The manager loved fast, attacking players, especially wingers. He used to bollock me regularly, but he never used to give Doc a bollocking – partly because he was very good at managing people and knowing what made them tick, but mainly because Doc did the right things every time, whereas I would end up learning the hard way. “Doc just didn’t upset the manager. Being the type of player he was, a winger who was unpredictable and took risks, you would expect him to lose the ball from time to time, but honestly he would lose it very rarely. He was a freak. He was incredible. “He was definitely at the same level as me. He had been involved with the first team before me and he had travelled with them a couple of times. He was definitely on the brink of making his first-team debut. “Who knows what would have happened if things had gone differently? He definitely had the talent. You never know for certain whether players will adapt and do it in the first team, but my guess is that, mentality-wise, it would have been no problem for him. Extracted from Forever Young: The Story of Adrian Doherty, Football’s Lost Genius by Oliver Kay (Quercus, £20). More info here. Email “'Music seems to excite him as much as football. Poetry, too, it is rumoured'”. Feedback on “'Music seems to excite him as much as football. Poetry, too, it is rumoured'”.